Khlong Toey (meaning pandanous tree canal) is an urban district in Bangkok expressing the city profound socio-economic divides. Right in the heart of the capital and close to the main port, Khlong Toey hosts the city’s largest low-income community of about 100,000 people. Born in the 1950s on land owned by the Port Authority of Thailand out of a squatter settlement of migrant from the North and the North East of Thailand, it continues to expand as the need for cheap housing remains among the many who arrive in Bangkok in search of better livelihoods. Today, a unique mix of people, including from outside Thailand, crowd a low and swamp-like area of about 1.5 square kilometers with their tiny and fragile homes and makes a living with limited means and amidst poor sanitation and health care, crime and drug addiction among others. The photo exhibition organized by SEA Junction in the first floor of BACC on 10-22 July from 11AM to 7PM showcases the life stories of six residents of Khlong Toey as chronicled by Kim Yoonki over a period of 12 years. As the photographer tells it, he did his first photos in 2006 as part of a project focusing on poverty and deprivation. However, as time passed, he saw that there was much more to the life of the “have nots” and started to appreciate the uniqueness of the community and people’s resilience, solidarity in finding communal solutions, and openness in receiving new comers, notwithstanding the tensions and up and down of daily life. His project “70Rai project” named after a part of the slum, became his life work and he has kept making weekly visits to the community and taken thousands of photos of the people who live there. By sharing his chronicles of a few Khlong Toey residents, Kim Yoonki hopes that the exhibition will confront some of the stereotypes about “poor people” and foster the respect they deserve. The exhibition will be opened at SEA Junction (Room 408, 4th Floor BACC) on 10 July at 6 PM – 7.30 PM with a talk by Father Joe Maier, the founder together with sister Sister Maria Chantavarodom of the Human Development Foundation/Mercy Center, the main organization providing community services in Khlong Toey since the 1970s, and by the photographer Yoonki Kim. Kim Yoonki was born in 1955 and was raised and lived in Seoul until 1994 when he settled in Bangkok. 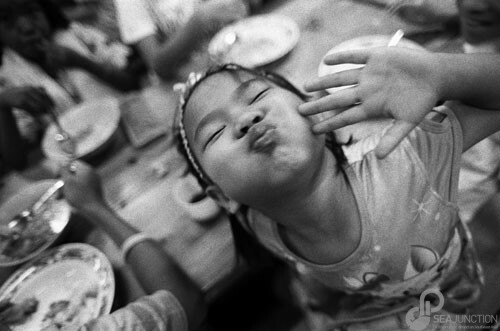 He is a self-taught photographer who has started the 70Rai project in a underprivileged area of Khlongtoey, Bangkok in January 2006. Every week he visits the area and take pictures using only black and white films of the people and the community and donate the prints to them. Before this exhibition at SEA Junction he has exhibited in 2009 at BOKA Gallery and in 2006 at FCCT.